During a holiday in Zakynthos, tasting the typical dishes of Greece and traditional of the island is something really not to relinquish. 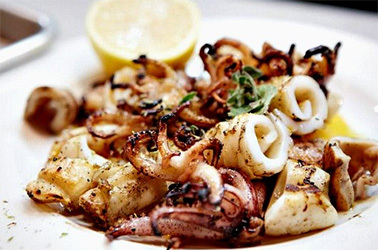 At mid-day, and in particular, at dinner, the thousands of smells invading the streets will drive you to one of the many taverns to find out a Mediterranean cuisine where meat, fish, olive oil and vegetables are fundamental and will always surprise you for the authenticity of their tastes. The local products such as honey, olive oil, cheese, goat yogurt and dishes of the island such as stuffed rabbit or the “spetsofai” are very important and worth of tasting at least once. Here below you can read about some of the most popular typical dishes and to aspiring cooks we suggest two very nice recipes. 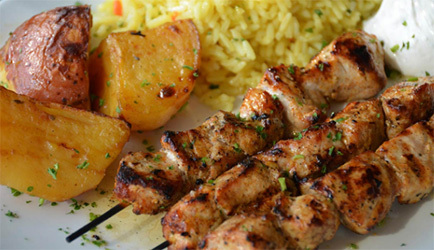 The Greek cuisine is so rich in taste and choices to risk finishing a meal with the starters. 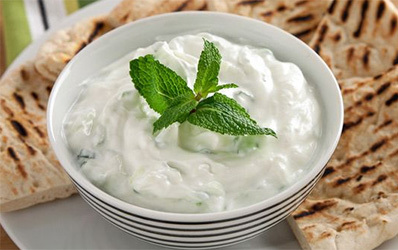 Among the typical starters there are the melitzanosalata, the taramosalata and the tzatziki that are sauces to spread on bread and consist of aubergines, fish eggs and the last one the most popular of yogurt, cucumbers and garlic. You can taste meatballs of different kinds with potatoes, zucchini, fish, oregano; fried vegetables such as aubergines, peppers and zucchini or if you are looking for particular tastes, dishes such as polyps cooked into wine and the dolmadakia, roulades of grapevine leaves stuffed with rice. We suggest also to try the tyropitakia: puffed pastry filled with feta, the Greek national cheese. As a starter or together with the main course you can have a tasty salad. 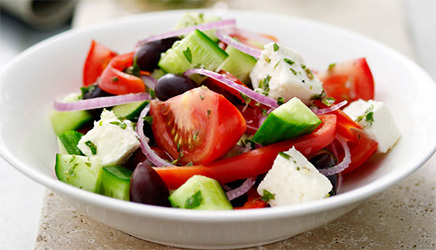 The Greek salad (horiatiki) consists in wedges of tomatoes, cucumbers, green peppers, onions, black olives and feta cheese all dressed with olive oil and oregano. There are also the potatoes salad, the lettuce salad or the beans salad. Even if we are on an island meat is the locals favourite dish and the recipe with meat are many. the stifado (calf with onions and tomatoes sauce) and the youvetsi (lamb with pasta). With minced meat there are the bifteki (a big meatball with onion, parsley, and garlic), the mousaka with aubergines, meat, onions, tomatoes and béchamel similar to lasagne and the papoutsakia (aubergines stuffed with meat and béchamel). The recipes with fish are for sure less than the ones with meat. In spite of this during your holidays you’ll have the opportunity to taste different varieties of fresh fish from the small marides to swordfish, very good both fried and grilled. Thanks to the favourable climate, vegetables are used as garnish and as main course. Among the typical dishes there are the imam aubergines (stuffed with onions, tomatoes and parsley and then baked), the briam (baked potatoes, carrots, zucchini and small tomatoes) and stuffed tomatoes and peppers (the filling consists of rice and tomatoes). 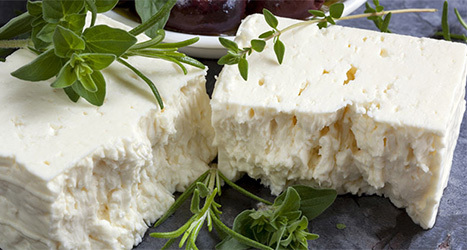 The Greeks produce a lot of locals cheeses and they also import foreign cheese. The most common in the restaurants and in the taverns are for sure feta (with ship milk and also with a spicy version), the manure (white and tasty and made of ship milk too), the kefalotiri (hard cheese good to grate) and the two typical cheeses of the island: tirokafteri (peppered soft cheese to spread so spicy to be served as a starter) and ladotiri (spicy cheese). If you don’t feel like eating in a tavern, you can taste puff pastry or focacce typical of Greece that you can find everywhere in the island. The most common is the tyropita a puff pastry served warm and stuffed with feta or you can find it stuffed with spinach, ham, cheese, meat or with many ingredients. 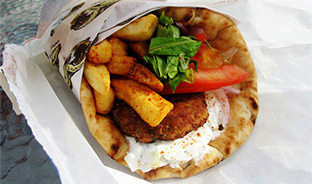 It is the fantastic sandwich typical of Greece. It is a sort of rolled bread stuffed with pork meat, tomatoes, onions, fried potatoes, the typical tzatziki sauce and according to where you buy it with a special ingredient (some invented their one salsa, some add salad…). 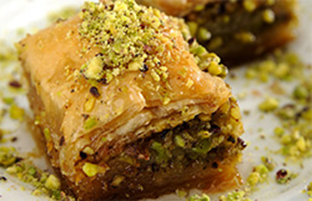 The ones typical of the place easily recognizable because they have nuts, almonds and cinnamon as main ingredients: the baklavas and the kataifi. There is also an excellent puff pastry stuffed with cream and covered with icing sugar and a cinnamon called bugatsa. To well complete every meal we suggest to order a Greek coffee. This drink whose preparation is almost a ceremony as to be slowly sipped to allow the coffee dregs to deposit at the bottom of the cup. 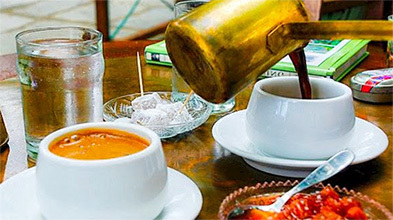 You can have the coffee without sugar (pikrò), with sugar (mètrio) or sweet (glikò). In Zakynthos the taverns are almost always open and the owners very friendly and nice in suggesting their menu or dish of the day.